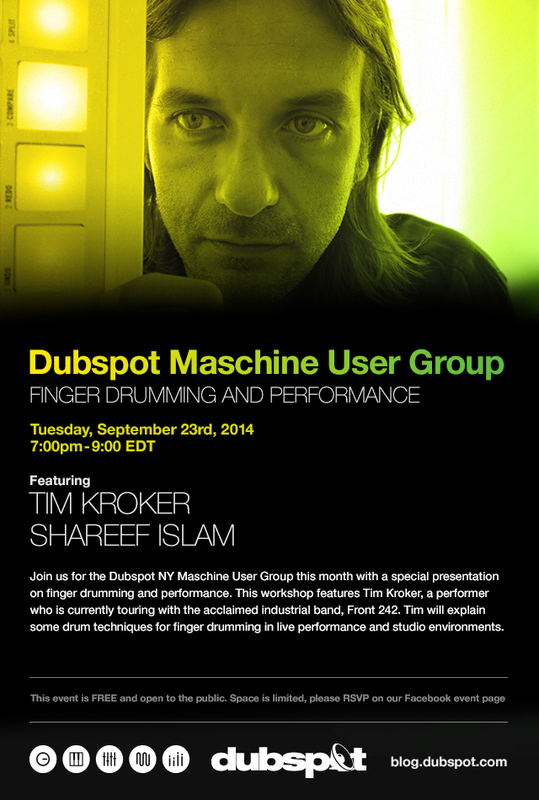 On Tuesday, September 23rd, the Dubspot NYC Maschine User Group meets for a workshop on finger drumming with Tim Kroker (Front 242) and Shareef Islam. Join us for the Dubspot NY Maschine User Group this month with a special presentation on finger drumming and performance. This workshop features Tim Kroker, a performer who is currently touring with the acclaimed industrial band, Front 242. Tim will explain some drum techniques for finger drumming in live performance and studio environments. Dubspot instructor and Maschine guru Shareef Islam hosts this free workshop at Dubspot NY. This event is FREE and open to the public. Space is limited so please arrive early and RSVP at our Facebook event page.